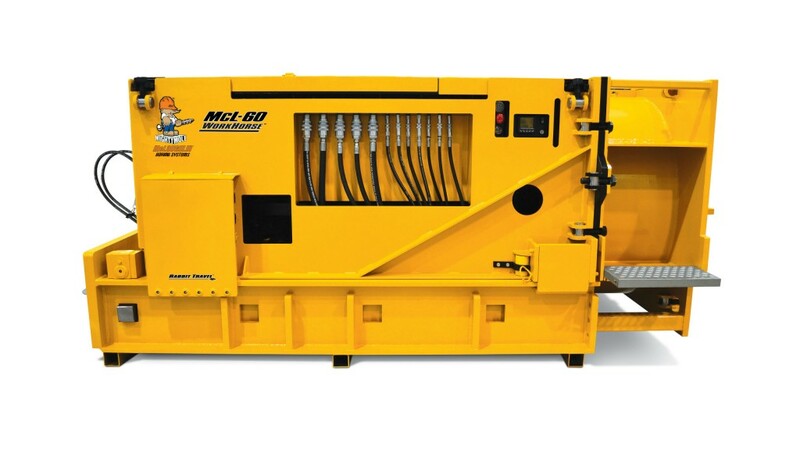 Powered by a 218-hp (160-kW) Volvo turbocharged engine, the new McLaughlin McL-60 is the company’s first Tier 4 Final compatible auger boring machine and is designed to install steel casing up to 60 inches (152.4 cm) and produce bores up to 700 feet (213.4 m) in length. The McL-60 was built on features that allow contractors to be more productive on the jobsite each day. By implementing a low-profile engine design, the McL-60 fits easily beneath the trench box spreader bars for more efficient jobsite setup. The addition of an Eskridge gearbox allows for increased torque — up to 126,000 ft/lbs (170,833 Nm) — in the McL-60 and, in turn, longer bore lengths, helping contractors to install more feet per day. The new remote control feature allows the McL-60 to be controlled from outside the excavation pit for increased operator convenience and productivity. The Rabbit Travel feature accelerates the process of pulling augers by eliminating the need to use the cylinders of the machine to install the product type.